Global urban centres directly affect the lives of billions of people and have a substantial impact on the surrounding environment. 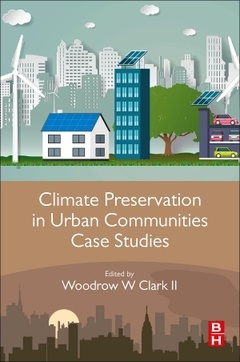 Climate Preservation and Urban Sustainable Communities Case Studies delivers a first-hand applied perspective on the challenges and solutions when creating urban communities that are adaptable and resilient to climate change. With this reference, professionals gain valuable insights into the real life challenges and solutions when designing, planning and constructing urban sustainable communities. Climate Preservation and Urban Sustainable Communities Case Studies, provides real world examples of innovative technologies that contribute to the creation of sustainable, healthy and liveable cities. In this reference, examples of successes, failures and solutions are presented, in order to set a benchmark for individual sustainability projects. Case Studies are selected based on a cross disciplinary approach for infrastructural systems such as: drinking water, wastewater, power systems, as well as broadband, Wi-Fi, transportation, and green buildings technologies. Woodrow W. Clark, II, MA3 , PhD, is an internationally recognized scholar and expert in economics, renewable energy, sustainability, and sustainable communities. He was a contributing scientist to the United Nations Intergovernmental Panel on Climate Change (UNIPCC), which as an organization was awarded the Nobel Peace Prize in December 2007 along with Al Gore and his film “An Inconvenient Truth."